We began our search for a new RV the moment we decided to sell our old one. My heart bleeds gypsy blood and to not have an RV would make the next few years feel even more like a prison than it already does. Okay, so I’m being a little dramatic but we love having an RV for many reasons. It makes traveling affordable. RVing allows us to be remote or as urban as we want to be. It’s one of the ways our family connects and creates forever memories. 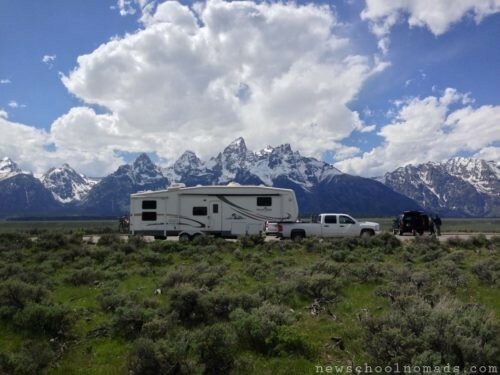 RVing allows for more comfortable and extended visits with family. I love my family but I also love my space. When we first started RVing many years ago we had a pop-up trailer that we loved. 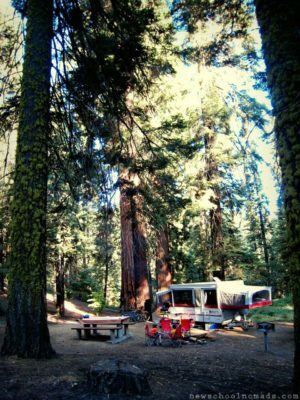 We would park it under the shade of the Sequoia trees in the Sierra Nevada Mountains or along the California Coast. It was perfect for that time of our lives. 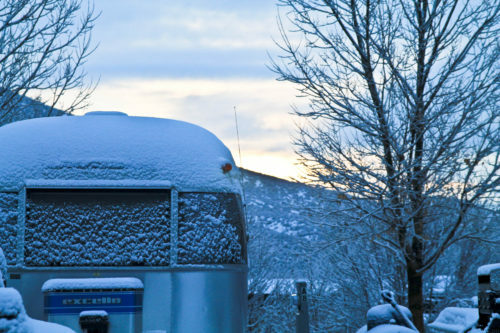 Since then we’ve discovered we love winter RVing so a pop-up isn’t going to work. We’ve also grown a bit and were spoiled by our 41’ Gateway fifth wheel. In between the pop-up and Gateway, we had a 35’ Cedar Creek fifth wheel. It was really great but the big boys really wanted more space if we were going to keep full timing and I was kinda tired of the small kitchen counter. The one thing we loved about the Cedar Creek was the shorter length opened up more camping options. Many parks have 35’ length restrictions and we fit in a lot of driveways. The Gateway at 41’ no longer fit in my or Brent’s parents driveway and occasionally we couldn’t stay in some parks because it was too big. We don’t regret purchasing the Gateway and would buy it over again if we were full time RVing but now that we aren’t, we are looking for something shorter so we have more options. Last but certainly not least, we no longer have the diesel 3500 Chevy dually to pull the RV. After some discussion we decided that we didn’t want to continue paying those expensive truck payments for a truck that our entire family couldn’t fit in. In hindsight, we should have bought a less expensive truck that seated six. Or maybe not. Six of us in a truck would have been tight especially with two car seats. So after a lot of research we decided to buy a diesel Ford Excursion. I’ll do another post on buying the new SUV because a lot of research went into it but the short of it is that it can seat six people comfortably and it can haul a heavy load giving us more options for travel trailers, the point of this post. So without any more rambling let’s talk travel trailers. 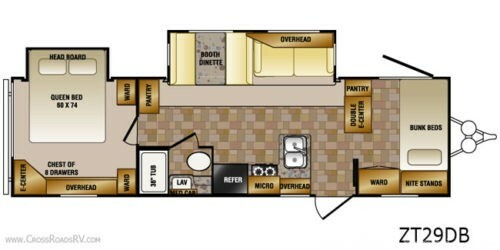 It seems to us there aren’t as many bunkhouse floorplan variations for travel trailers as there are for fifth wheels. Also there aren’t as many slideouts presumably to keep the weight down since slideouts are heavy. So we have been trying to prioritize and figure out our needs for RVing. 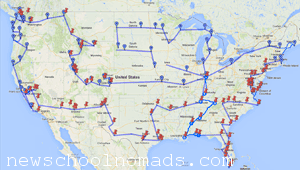 While we aren’t full time RVing we do plan on taking a 2 month trip every year and want to be comfortable. So here is what we are considering so far. Weight – A trailer that weighs less than 10,000 pounds unloaded (UVW). The lighter the better but we can go up to 10,000 as long as we make some modifications to the Excursion. Again another post. New or Used – Our first two trailers were used and they held up great. Normally, we buy everything used so it was a big deal for us to buy a new trailer when we bought the Gateway. We had looked at probably over a hundred floorpans and it was the only one we loved everything about and it was new that year. Of course. We decided it was worth it to purchase the Gateway even though we rarely purchase new. We are facing the same problem again, a few of the floor plans we love are new this year. Obviously, we would prefer to keep cost down and purchase used. However, we don’t regret our purchasing the Gateway new at all. Surprisingly, it held its value very well and we sold it quickly. Since we had such a great experience with a new rig (the warranty is nice) we are considering new. Slide outs – Are slide outs a must? If so how many and where? Two slide out bunkhouse trailers tend to put one in the back bedroom and another one in the middle living area. Three slide out trailers have a few more options. Some have one in the back bedroom and two in the middle. Others have two in the back bunkroom and one in the middle. A few have one in each room. Regardless, if we decide we “need” slide outs, we are trying to decide if we want more space in the living room or bedrooms. We are leaning towards extra living room space but trying to decide how important double living room slide outs are to us. 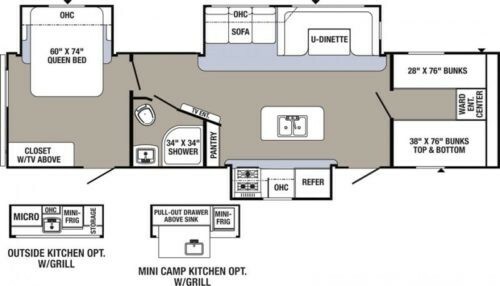 Bedroom Layout – At first it seems like the only travel trailer floor plan option was a back bunkhouse and a front queen bed with the head of the bed situated at the front of the trailer. But then I found the front bunkhouse models. These typically have more room around the master bed and since the littles sleep in our room with us (they do in our house too) this would be much more comfortable and give Brent a good space to work for extended trips. The tradeoff is a smaller bunk room but the teenagers they don’t need as much space as they once did since we aren’t full time. Even in our Gateway they spend a lot of time lounging in their beds so we are leaning towards a larger master bedroom. “Character” – Before we went on the road we looked at a vintage bus and I loved it. It had so much character and personality. However practically outweighed personality for full time RVing. Since this one is for part time only, we are considering something more “fun” like a vintage camper. We love remodeling/renovation projects and think it would be fun to renovate and older trailer and make it something that “fits us”. However, vintage trailers sacrifice modern comforts and we just aren’t sure we want to sacrifice modern comforts. It’s hard to say what “best family travel trailers” really are because each family has different needs. After months of research these are the travel trailers that we think would be best for our family. 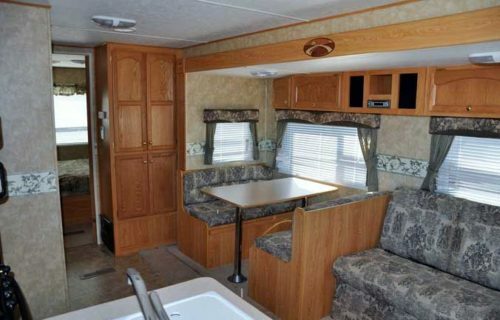 The Cougar X-Lite 32 FBS was the first travel trailer floor plan we came across with a rear master bedroom. When we went to Indiana over spring break, we saw it in person and loved it. 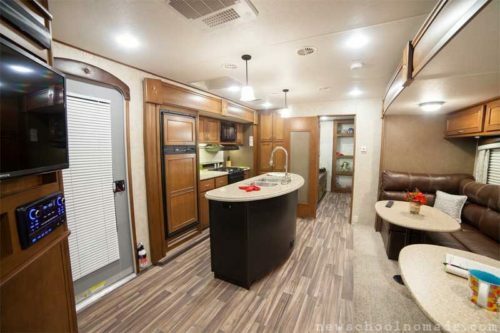 There is a ton of space in the back bedroom and there is more floorspace in the Cougar front bunkhouse than some other travel trailers due to the slide out closet and two as opposed to three or four bunks. The downsides to the Cougar are: it’s only available new and it only has one slide in the main area. However, since there isn’t an island the the floor space is about the same. It’s really just sacrificing counter space. While at the dealership looking at the Cougar, we saw the Highland Ridge Open Range Light LT308BHS. I was impressed with all the space the moment we walked in. 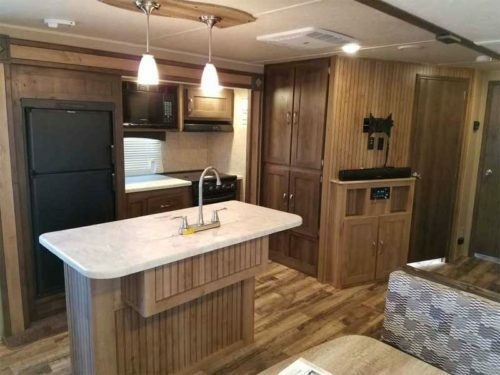 Although the master is in the front, there is still more room in the master than other travel trailers of the same layout because Highland Ridge adds 4 inches in width over the standard width of most travel trailers. When you are talking space in RVs a few inches can make a HUGE difference. Highland Ridge also comes with a 2 year warranty and is known for its quality build. The Roamer RT310BHS is basically the same floorpan but with an extra slide out closet in the front bedroom for a total of FOUR slides! We absolutely LOVE these Highland Ridge floor plans and if they were in our budget we would buy one of these in a heartbeat. We haven’t seen the Puma 32FBIS in person but while I was searching for front bunkhouse travel trailer floorpans I came across this one. I love the layout with the master bedroom in the back and the double slides in the living area. We are concerned about how this one would do in colder climates though so we will be doing some more research. Also the front bunkhouse is a little tight if there is an outdoor kitchen but it’s fine without the outdoor kitchen. A few more with this great floor plan are the Prime Time Lacrosse 336BHT and the Prime Time Avenger 32 FBI. We aren’t familiar with the Prime Time brand but we love the layouts. Grand Design is a newer brand. 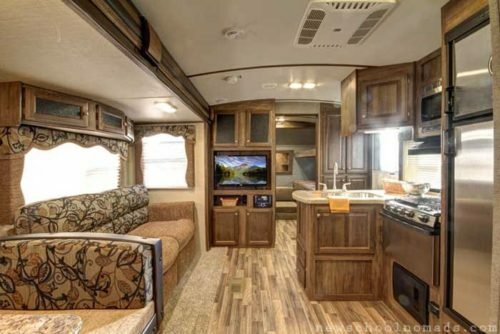 We toured a Grand Design fifth wheel when we filmed the reality show, Going RV, last year. They seem to be of very high quality. Then we went through one of their travel trailers at the RV show in Denver a few months ago. We really liked the finishes. Although the trailer has a front master bedroom, it felt a little more spacious that some of the others we’ve toured. Thanks to my OCD, I’ve been checking Craigslist multiple times day and came across the Crossroads Zinger 29DB. We really like the back bedroom and how the bunks lie horizontally in the front cutting down on the length and weight of the trailer. While we don’t LOVE this RV, it’s affordable and would be comfortable for our family without adding debt. Since it’s used I wouldn’t have emotional hang ups about painting brand new cabinets and walls. It would be so much fun to do another RV makeover! For years, Brent and I have talked about buying a vintage trailer or bus. In a post I wrote in March 2011, I mentioned my dream of rolling down a dusty highway in an Airstream, a shiny piece of Americana. We love bringing old things back to life. Although, we don’t have experience renovating a trailer, we did renovate two 1950s houses in California. A trailer can’t be that much harder to restore than a house, right? Years ago, when we bought our pop-up trailer, our tow vehicle was a Honda Odyssey so we were very limited by weight and budget. Today, we have a bigger budget and tow vehicle so maybe now is the time to pursue our dream of restoring and remodeling a vintage Airstream! We have a perfect space to park it while we work on it. We’ve been researching and really love the 1980’s Excella models, particularly the 34 footer with the double beds in the back. We have all sorts ideas to customize it to fit our family and personality. The downside, besides the lack of slide outs, are the prices of older Airstreams are all over the map and good deals sell really fast. Seriously, we saw the exact trailer we wanted for $7200 but it sold the night before we called. The same models are ranging from 9K t0 20K and upwards! The upside is Airstreams are well built and hold their value. There are so many choices and each one has their pros and cons. Do you have experience with any of these brands or models? Should we go with our heart and buy a vintage Airstream or use our head and buy a newer RV? What would you do? We would like to make a decision soon!